For those of you interested in public relations (PR), Google has a new reputation management tool that may be of interest to you. “Me on the Web” helps you control how you appear in search results and has options for managing online identity and removing unwanted content. “Your online identity is determined not only by what you post, but also by what others post about you — whether a mention in a blog post, a photo tag or a reply to a public status update,” Google explains. “Me on the Web” is located in the Google account dashboard between account information and analytics. If you don’t already have a Google profile, making one is the first step in getting started. The first thing you will need to do is login to your Google Dashboard, located at https://www.google.com/dashboard/. If you don’t already have a Google account you can quickly register for one. Click in and then enter your name on the next page and hit “Create Profile & Continue.” You can also add a picture of yourself here if you’d like. You can view your profile later at http://profiles.google.com/me. Your profile will appear visible to anyone on the web. Also, anyone with your email address will be able to find it. But, you can control what is on your profile in the next step. 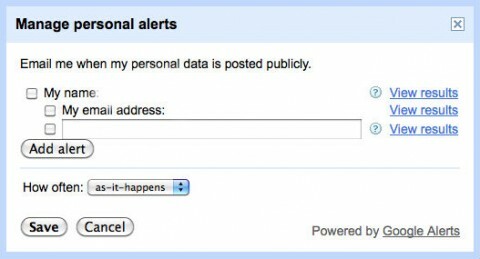 Return to your dashboard and select “Set up search alerts for your data.” You will be given a choice of how you would like to be notified of information appearing in search results about you. You can select by your name, email, or fill in other words that relate. Then you can choose your notification to be as-it-happens, once a day, or once a week. Click save to finish this step. Unfortunately, there is no magic button for removing unwanted content from non-Google-owned products. Google suggests you consult the webmaster of the site which has posted your undesirable content first to see if it can be removed. For more detailed instructions on this visit Remove a page or site from Google’s search results. If you’re contacting a webmaster, be courteous and explain the situation. They probably get many requests, so be patient. But, if your unwanted content is on a Google owned product, the process is simpler. Head to Removing Content From Google and select the product your request is related to. Each product follows a different procedure, so follow the steps they provide you with.